Citizen scientists, volunteers with the Earthwatch Institute, conduct tree surveys near Truckee, Calif. as part of meadow and carbon research conducted by the University of Nevada, Reno's Soil Science Laboratory directed by Ben Sullivan in the College of Agriculture, Biotechnology and Natural Resources. Credit: University of Nevada, Reno. Turning meadow restoration into cleaner air is the goal of researchers at the University of Nevada, Reno. 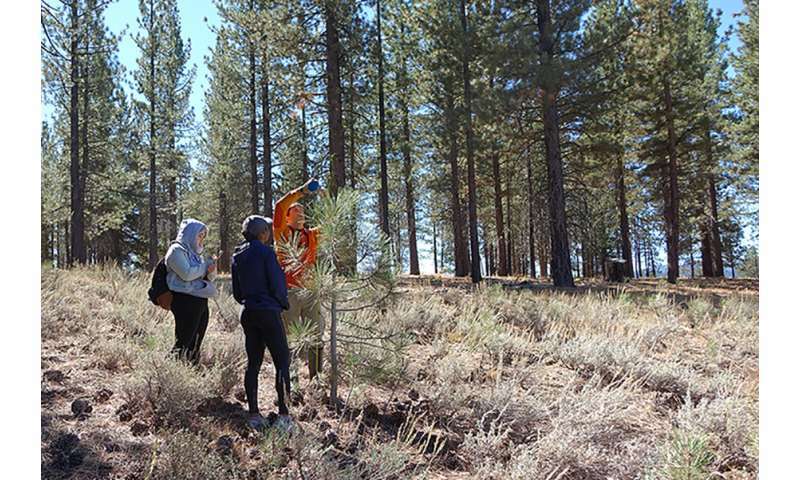 The Soil Science Laboratory at the University recently partnered with the Earthwatch Institute, an international citizen science research organization, to better understand how restoration and plant communities relate to the soil carbon in Sierra Nevada mountain meadows. "Since Euro-American settlement, plant and water resources in meadows have been manipulated. There aren't many pristine meadows left in much of the Sierra Nevada mountains," Ben Sullivan, soil scientist and biogeochemist with the University of Nevada, Reno, said. "As a consequence of the disturbances, meadows are losing carbon, in the form of carbon dioxide, to the atmosphere that was once stored in the soil for long periods of time." Many meadows have been disturbed by human use, resulting in lower water tables and drier soil conditions. As a result, soil carbon can be decomposed by microbes, resulting in production of carbon dioxide, a greenhouse gas. However, trees and shrubs take up the carbon dioxide, and dry, disturbed meadows often have trees and shrubs establishing in these formerly wet ecosystems. People often see the carbon in the trees and think that degraded meadows have more carbon. But that doesn't consider the much greater amount of carbon in the soil, and the carbon dioxide balance isn't acre for acre. "One acre of degraded meadow releases as much carbon dioxide as 11 acres of forest takes up," Sullivan, an assistant professor in the Department of Natural Resources and Environmental Science, said. "We want to quantify above ground and below ground carbon stocks in meadows and know if an increase in aboveground carbon associated with trees growing in a former meadow is offset by much greater losses of soil carbon below ground." While the research area stretches much of the length of the Sierra Nevada from Mt. Lassen to Bishop, Calif., this recent research was performed in four meadows in the Truckee River watershed and involved about 75 volunteer participants from northern California and the Reno area, including a student organization at Hug High School in Reno; students in a University of Nevada, Reno English composition class on "Science and Society;" and students from the University of California, Berkeley Forestry Camp. The project focused on measuring the carbon stored in plants and determining if vegetation is an important indicator of the amount of carbon below ground. Sullivan, students in his lab, and the team of citizen scientists quantified the amount of carbon in trees in the nearby forests as well as where trees and shrubs are establishing within the meadows. They measured the diameter and height of trees and shrubs and clipped small plots of grasses to measure the amount of carbon in the vegetation. Involving citizen scientists allowed the University research team to vastly increase their sampling capacity and address scientific questions at larger scales. "We got weeks of work done in a couple of days thanks to our citizen scientist volunteers," Sullivan said. "It's a valuable program, and we're grateful for the Earthwatch collaboration. The Earthwatch Institute typically supports international research, so it's exciting to lead a research campaign that allows volunteers to learn about their own back yards and be back at work on Monday morning." The research was designed to increase scientific literacy of area students and residents, engage citizens in the scientific method, and improve understanding of how carbon stocks in meadow vegetation change from the forest to the stream. "The carbon builds up in the cold, wet meadow soil in the Sierra over thousands of years," Sullivan said. "But disturbed meadows may be a net source of carbon dioxide and other greenhouse gases, like nitrous oxide and methane, to the atmosphere. We have to understand what is happening in degraded meadows, so we can quantify any positive effects of restoration." "Restoring meadows can have many benefits, but we want to know if it can also increase the soil C sink by making the meadows wet again" Sullivan said. "Because meadows have been restored in the Sierra for the past 15 years, we can measure how carbon stocks change over time and where in the meadow the changes happen and what the levels are. We want to know if meadow restoration could increase the ability of meadow soil to retain and store carbon." The team aims to develop a model that can predict how much carbon is sequestered in a meadow. The data may be used by the State of California Air Resources Board to sell carbon credits through their Cap and Trade program that strives to reduce greenhouse gas emissions in California to 1990 levels by 2020. If the research shows that meadow restoration locks up carbon, the program could allow landowners who restore a meadow area to sell carbon credits - potentially offsetting costs of restoration. "In addition to Earthwatch, we are working with partners at Plumas Corporation, CalTrout, the Truckee River Watershed Council - and many more - to address these questions about Sierra meadows," Sullivan said. "We look forward to even more citizen scientists working with us in the coming summers to help measure carbon in meadows while learning about these dynamic ecosystems." The volunteers found the work rewarding and beneficial. "The collaboration between Earthwatch and the University of Nevada, Reno represented an unprecedented opportunity for the students to not only learn about meadows, but to interact with graduate and staff researchers," John Arsenault, teacher at Hug High who brought some of his students into the program, said. "The discussion, questions and exploration that happened was experiential and real." The project will be presented by one of Sullivan's graduate students, Cody Reed, at the American Geophysical Union Fall Meeting on Tuesday, Dec. 13. Her poster presentation, titled "Anthropogenic disturbance of montane meadows may cause substantial loss of soil carbon to the atmosphere," will feature the two meadows studied this fall with the Earthwatch citizen scientists as well as an additional meadow Sullivan's team has studied. Studying the greenhouse gases produced and consumed by soils is one of Sullivan's primary research interests. He is an assistant professor in the College of Agriculture, Biotechnology and Natural Resources and a member of the University's Global Water Center.